Horror, anarchy and mass death are featured in this science fictional story of wartime Baghdad. When a man goes to pick up his friends body from the morgue, he discovers that it’s been blown into pieces by a bomb. More, his limbs have been mixed up with the bones and organs of all the other bomb victims. In a fit of madness, the man claims a random assortment of those limbs and cobbles together a Frankenstein’s Monster from the human wreckage. The Whatsit’sname comes to life, animated by the unquiet ghosts of those killed by Al Qaeda and Baathists and driven by their quest for revenge against them. This was a very impressive book. Translated from the original Arabic, Baghdad is portrayed as a run down, but still vibrant city under siege. 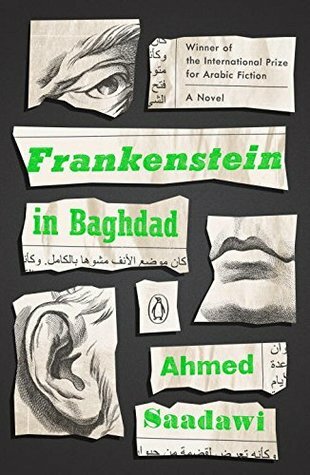 Honoring the source material by Mary Shelley, but retelling the story in 2008 Baghdad, FRANKENSTEIN IN BAGHDAD is a fascinating read. I liked the world it painted, where Assyrian Christians, Muslims and reformed Baathists live side by side. I’m keeping this review short because I need to keep my energy for NaNoWriMo, however I do Highly Recommend this story to pretty much everyone.